A low-slope commercial building has commercial roofing and drainage that use gravity to move water off the roof, through gutters and downspouts, and away from the building foundation. The downspouts can empty into a municipal waste water system or a drainage field on your property. Proper drainage uses parapet scuppers (the drains on the building’s exterior walls; a peripheral drainage system), interior drains (drains in the middle of a roof expanse), or both. With scuppers and interior drains, the correct sizes of leaders, gutters and downspouts are crucial to prevent standing water. Interior drains generally empty into standpipes inside your building. Having the standpipes inside provides a measure of protection and in Toronto, freezing downspouts are often a concern. Either from clogged drains or gutters and downspouts too small for the square footage, rainwater sitting on commercial roofing spells trouble. Ponding occurs when unintentional low spots allow water to collect. Water weight then compresses the roof insulation, exacerbating the problem. Standing water occurs around clogged scuppers and internal drains. Some parapet-style buildings have secondary scuppers a few inches higher than the regular scuppers just for this emergency. The standing water will drain, but that still leaves several inches of water on your commercial roofing, compressing the insulation and penetrating the top coating or layer. FlatRoofReplacement.ca can help you determine if your building has adequate drainage. Experts recommend two roof drains for the first 10,000 square feet of roof, and another drain for each additional 10,000 square feet or portion thereof. Drains should be no further apart than 75 feet. If the building roof is disrupted by piercings (pads for HVAC equipment or other protrusions), drains need to be placed to allow water to drain from trapped areas behind those protrusions. 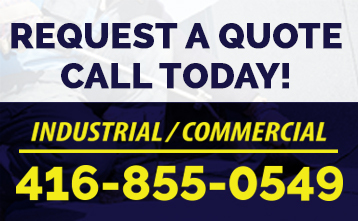 Contact us today to let us help you assess your building’s drainage system. An inspection today could save you the cost of a new roof tomorrow.